For the die-hard fisherman, even if it’s something you always wanted to do. We will take you to the deep ocean to fish some of the best sport fishing grounds found anywhere in the world, then provide a nice lunch and even cook some of the fish you yourself caught. Mmm, mmm, good! You can’t come to the Bahamas and not go snorkeling with the turtles. We will also take you to a private island where you can snorkel to your heart’s desire! Be sure to bring your cameras, because these memories you can’t possibly make up and will want to cherish forever.  What makes “Live 2 Fish” unique from all others? Not only do you fish, relax, tan, chill, snorkel and laugh! We are the ONLY ONES that grill what you catch! Our Captain in the best cook not only on land but out on the ocean. Order lunch for an additional cost and your catch will be added to your meal. Live 2 Fish has 1 versatile boat in the fleet. Whether you want to big game fish, light tackle, snorkel with turtles, enjoy relaxing at a private beach tanning and eating some really good Bahamian home made treats, we can fulfill your needs. We can custom make your island get away the way you like it. We are hard working, 100% honest Bahamians. We don’t promise anything in order to sell you a fishing trip. Before doing this, we were commercial fishermen since boyhood. We have a passion for what we do. Trust us. We will work to catch that next fish! We don’t post fake reviews. We try to film every catch. Weather permitting, we are equipped to clean and grill your fish right on the boat! There are NO hidden fees. We don’t charge you at the last minute for anything. Our boats were completely refurbished in 2013. 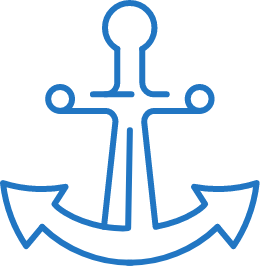 More importantly, the people who answer your calls or emails are the same people that crew the boats! 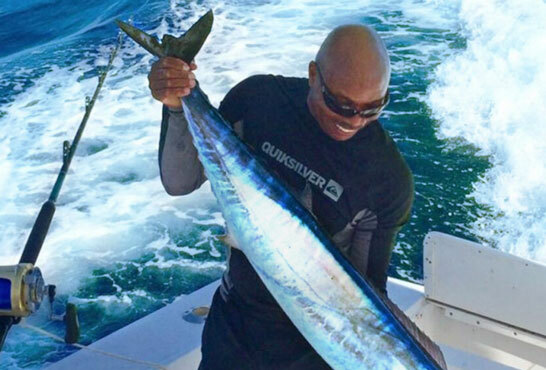 If you are looking to do some serious sport fishing here in the beautiful Bahamas, you have come to the right place. Allow the crews knowledge and expertise in big game tournament fishing to help you feel the rush and exhilaration of reeling in that monster catch. 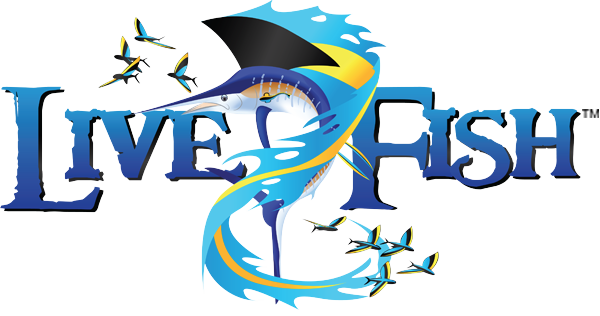 We will help you have a great time and have the opportunity to get in on the best saltwater fishing in the world. 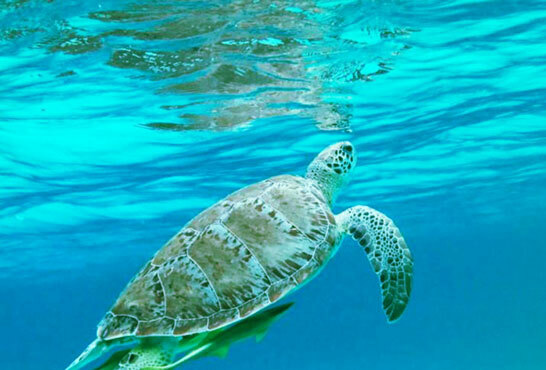 If you want a safe relaxing day on the water touring along our beautiful coast line to one of our islands secret secluded spots we can show you some of the nicest spots and have you snorkeling with turtles! 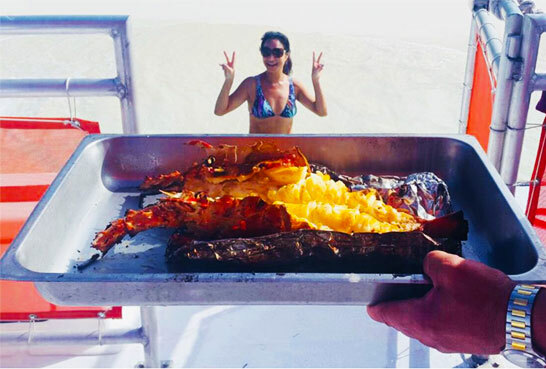 You can go snorkeling, then we will grill for you and while having a blast, the only thing missing is you! Hey, you’re on vacation, act like it. You can’t come to the Bahamas and not snorkel in our beautiful waters! We even grill what you catch! The only cooking vessel out to sea! * For Trips 6 to 8 hours. 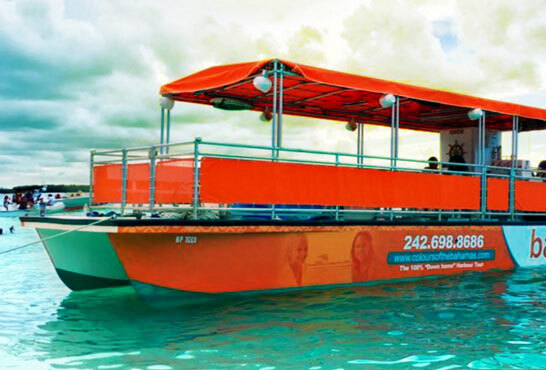 If you are traveling with a group and would like to have a private tour of the Harbour, visit Gilligan’s island, go snorkeling with Turtles, go to the beach to grill and chill or all of them, this private tour is for you! Ma’Boya seats up to 25 persons and can be privately chartered for one to eight hours of pure enjoyment! Well, my brother and sister-in-law made the arrangements and man did they find a crown jewel. Gina, Andrew and Caesar went out of their way to provide exceptional value making the fishing trip the top event of our v[a]cation, including golfing. We kicked off the morning on time and started getting hits on our lines shortly after zipping out several miles. I could not keep up with all of the Trigger fish, grouper, grunt and snapper we landed. Don’t let the party boat fool ya… these guys are serious fisherman who also know how to mix just the right amount of fun and gourmet food in with a great day of deep sea fishing. Our 8 hour day consisted of the perfect mix of activities – about 4 hours of open ocean trolling… 1.5 steak/lobster/fish-we-caught grilled right on our own private beach, and 1.5 hours snorkeling with sea turtles (plus 30 mins transit time each way). Live 2 Fish hosted our company’s 2017 Fun Day, and oh what a fun-tastic time it was. From bottom-fishing and swimming with the turtles, to an unbeatable meal (the captain is quite the chef – and comedian – too) and relaxing on the beach at Rose Island, we enjoyed a great and entertaining experience. 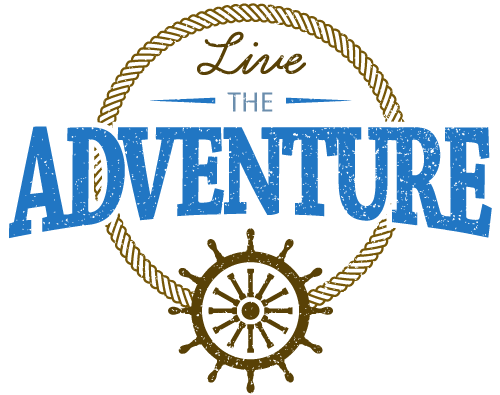 An adventure you wouldn’t want to miss!